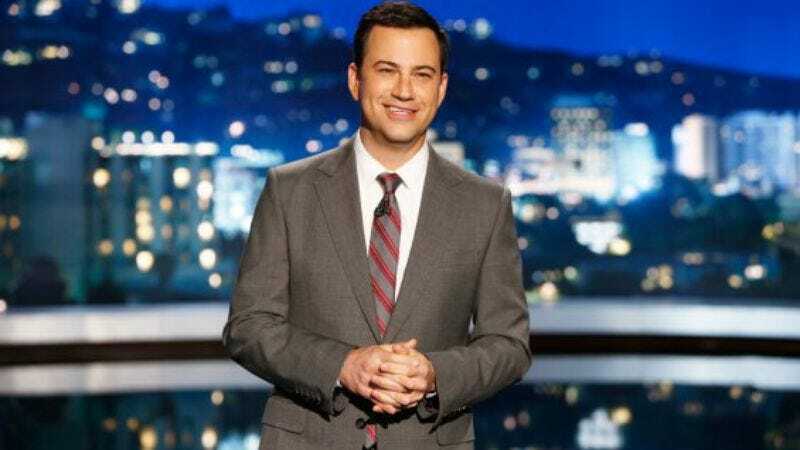 Like a young child exposed for too long to a shiny, hypnotic Trapper Keeper, Jimmy Kimmel has apparently gone hologram crazy. As part of a cross-promotion with the CMA Awards, the ABC host will spend an evening next month beaming 3-D images of himself and his guests between Los Angeles and Nashville. First, Kimmel will hologram himself—a new verb we just learned from Dr. Cool’s Hip Dictionary For Futuristic Space Cats—to deliver his nightly monologue to the CMA crowd. Then, he’ll have a CMA winner hologram into his studio for an interview, before holo-beaming a live performance to his outdoor stage. All of the light beam wizardry is being provided by Hologram USA, the same company that made America sit up and say, “Huh,” two years ago with a rapping Tupac hologram at the Coachella music festival. (Rumors that Hologram USA spends the majority of its time these days torturing Holo-pac for the whereabouts of the real Tupac’s buried gold have not been confirmed). Country music, awards shows, monologue jokes, and holograms—truly, all of the world’s greatest art forms and technologies will come together for this stunning celebration of gimmicky cross-promotion. The CMA Awards will air at 8 p.m. EST on November 5 on ABC, with Jimmy Kimmel Live! following immediately after.